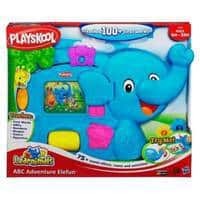 Learning numbers and ABCs and other new skills is more fun for your little buddy when he has an elephant friend, and that’s why we made the ABC Adventure Elefun toy! The toy’s more than 75 sound effects, tunes and activities make learning fun, and there are more than 100 words to learn. Your little one will squeal with delight when he pulls down the elephant’s trunk, because the toy will say the word that goes with the image shown. When he rolls the drum, it will say another word! Pulling down the mouse shows shapes and colors. For hours of big learning fun, the ABC Adventure Elefun toy is the best buddy your child can have! 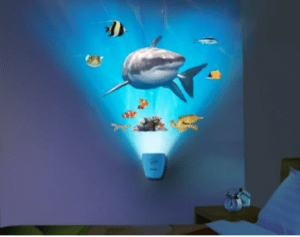 Ages 6 to 36 months. 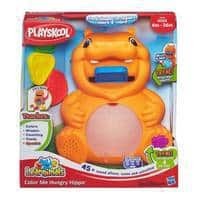 Colors, shapes, counting, foods: Your little one is going to find out so much with his Color Me Hungry Hippo buddy! With more than 45 sound effects, tunes and activities, this hippo toy challenges your little one to feed it shapes and enjoy 4 play-and-learn modes. The toy’s belly glows, and the color matches the shape colors! The toy teaches in English or Spanish. While your little one giggles and feeds his hippo friend, he’ll be learning about cause and effect and developing his motor skills. Start the hippo-feeding frenzy with the Color Me Hungry Hippo toy! Ages 6 to 36 months. Holidays are the time for gift giving and why not give your child a toy that has won 9 different toy and game awards? 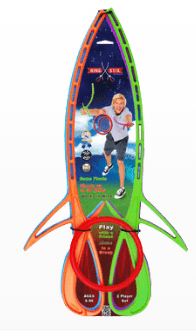 RingStix Lite is a totally new kind of outdoor game that gets kids wanting to go outside and play. RingStix engages your child to play outside, something that today’s children don’t do as often as their parents used to. It can be played with 1 or as many participants and the ages of 6+! The company created the game as a fun new way to get outside and encourage children to get active and off the couch. For more information, visit www.ringstix.com. Products are available on Amazon.com and most all are also in Toys “R” Us nationwide. Little Pim, the award-winning foreign language-learning program for young children, has introduced a special-edition product line now available exclusively at select Toys“R”Us® stores nationwide. 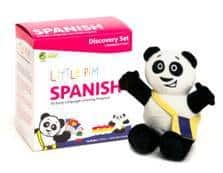 The new Spanish, Chinese, and English “Discovery Sets” each include three DVDs and a Little Pim plush panda toy, which are sure to make learning a new language fun and easy for kids everywhere. Between birth and the age of six, the human brain is pre-wired for language learning, and Little Pim helps families take advantage of this brief window, by making language learning easy, fun and effective. Their unique Entertainment Immersion Method® provides total immersion in the language. The method engages a child’s love of play watching real kids and animation. Little Pim’s proven repetition technique helps children retain new vocabulary. The program is the brainchild of Julia Pimsleur Levine, the daughter of Dr. Paul Pimsleur, creator of the Pimsleur Method, the popular language-learning program for adults. She was inspired to create Little Pim based on her own bilingual childhood. LEGO DUPLO introduces the youngest builders to so many ways to play with big bricks designed for small hands. 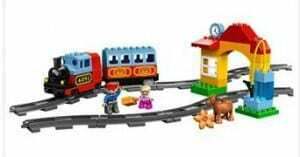 Young builders have the opportunity to be the conductor and operate the buildable and motorized train as it speeds around the track. Making the perfect start or addition to any LEGO builder’s collection, LEGO DUPLO bricks are compatible with classic LEGO bricks, so they can use the bricks for years to come! 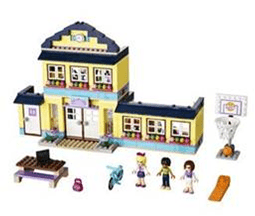 One of the most exciting and popular launches in 2012, LEGO Friends is now in its sophomore year and focusing on even more extra-curricular activities and sports for the five Friends of Heartlake City. Girls love to build, role play and identify with the Friends in new ways, and this set includes detailed elements and accessories for geography class, science class, art class and music class. A perfect gift for young girls with a variety of interests. One of the most anticipated toys of the year, and releasing this Fall, is the LEGO MINDSTORMS EV3 robotics set. Perfect for builders of all skill levels, LEGO MINDSTORMS EV3 provides younger builders easier access to the build-and-play program experience, while offering more advanced users the foundation to write their own programs on the Linux based operating system. Utilizing new 3D building instructions or classic building instructions, builders can build 5 hero models out-of-the-box with an additional 10-15 models available online for further building inspiration. The building possibilities are endless, and will be sure to delight young and more seasoned LEGO builders this Fall!